By Tiffany Bonafe, D.O., Refky Nicola, D.O., James Kovacs, D.O. A 62-year-old woman presented to the emergency room with diffuse abdominal pain and abdominal distention. White blood cell (WBC) and platelet counts were within normal limits. Radiographs of the abdomen demonstrated no evidence of pneumoperitoneum. Subsequently, CT of the abdomen and pelvis was performed for further evaluation (Fig.). Interstitial Abdominal pain as a presenting symptom engenders a broad differential diagnosis. The role of imaging for localization and causation of abdominal pain is well-established. CT findings of omental fat stranding and infiltration and/or soft tissue density foci are helpful in narrowing a vast differential for abdominal pain to include diseases which primarily affect the omentum. These conditions include segmental omental infarction, omental hematoma, and peritoneal carcinomatosis, and tuberculous peritonitis. Solid neoplasms of the omentum containing fat are rare. Liposarcoma, which is typically found in the retroperitoneum, is rare in the peritoneal cavity. Certain imaging characteristics, paired with patient history, help to differentiate between many possible etiologies. Omental involvement in traumatic injuries results more commonly from penetrating trauma compared to blunt abdominal trauma.5 Isolated omental or mesenteric injury is uncommon; secondary injuries are typically seen.9 Just as direct trauma to omental vasculature can cause infarction, it can also result in omental hematoma. CT findings often include a distinct omental fluid collection measuring blood attenuation but can also manifest as an ill-defined hyperdense region of infiltration of the omental fat with associated hemoperitoneum. A careful search for active hemorrhage with high-attenuation extravascular foci is of utmost importance. The patient’s medical history and clinical presentation are key in identifying patients with omental hematoma. Occasionally, a history of trauma is not elicited, such as in cases of domestic violence or in patients suffering from head injury or the effects of alcohol or illicit drugs. Malignant seeding of the peritoneal cavity is a common occurrence in many genitourinary (particularly ovarian) and gastrointestinal cancers. Omental involvement can range from “increased density of fat anterior to the colon or small bowel to large masses, called omental cakes.”6 When carcinomatosis manifests as ill-defined fatty infiltration or small soft tissue density nodules, it can be especially difficult to distinguish from other omental pathologies, including rare primary neoplasms. Even in the absence of a known primary at the time of imaging, peritoneal carcinomatosis must rank high on the differential for omental lesions. Histopathological confirmation with biopsy is often necessary. Because CT findings are not specific or pathognomonic, the patient’s clinical history and laboratory findings, coupled with a high clinical suspicion, are important in securing a diagnosis. Abdominal pain is one of the most common presenting symptoms in the emergency room. Diffuse omental thickening and/or stranding, or the presence of focal omental nodules on CT examination are useful clues in limiting the differential to disorders which affect the omentum. Correlating these findings with the clinical scenario and medical history aids the practicing radiologist in directing the referring physician to a correct and specific diagnosis. Alagumuthu M, Das BB, Pattanayak SP, et al. The omentum: a unique organ of exceptional versatility. Indian J Surgery 2006: 68(3); 136-141. Barai, K, Knight, B. Diagnosis and management of idiopathic omental infarction: a case report. Int J Surg Case Rep 2011: 2(6); 138-140. Par TU, Oh JH, Chang IT, et al. Omental infarction: case series and review of the literature. J Emerg Med 2012: 42(2); 149-154. Awe JAA. Laparoscopic diagnosis and treatment of primary segmental omental torsion with infarction mimicking acute appendicitis: a rare cause of acute abdominal pain. Glo Adv Res J Med Med Sci 2014: 3(3); 54-58. Como JJ, Bokhari F, Chiu WC, et al. Practice management guidelines for selective nonoperative management of penetrating abdominal trauma. J Trauma 2010: 68(3); 721-33. Smiti S, Rajagopal KV. CT mimics of peritoneal carcinomatosis. Indian J Radiol Imaging 2010: 20(1); 58-62. Pickhardt PJ, Bhalla S. Unusual nonneoplastic peritoneal and subperitoneal conditions: CT findings. RadioGraphics 2005;25(3):719-30. Ha HK, Jung JI, Lee MS, et al. 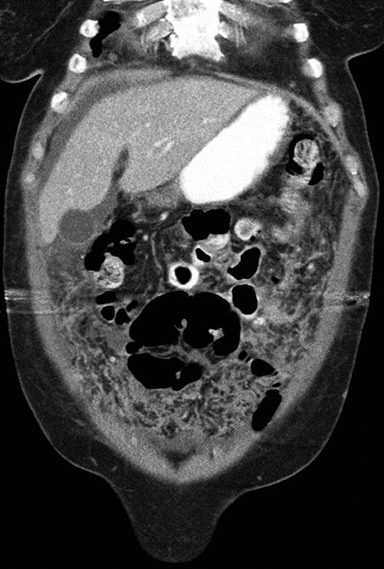 CT differentiation of tuberculous peritonitis and peritoneal carcinomatosis. Am J Roentgenol 1996;167(3):743-48. Pereira JM, Sirlin CB, Pinto PS, et al. 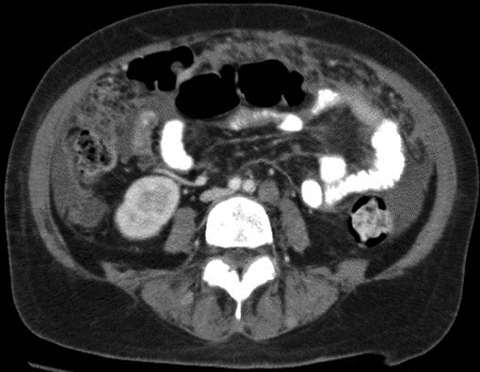 Disproportionate fat stranding: A helpful CT sign in patients with acute abdominal pain. RadioGraphics 2004;24(3):703-15. Bonafe T, Nicola R, Kovacs J. Differential Considerations for Omental Fat Infiltration and Thickening on CT. J Am Osteopath Coll Radiol. 2014;3(4):22-24. Tiffany Bonafe, D.O., Refky Nicola, D.O., James Kovacs, D.O. Dr. Bonafe and Dr. Kovacs are with the Department of Diagnostic Radiology, UMDNJ-Rowan Medical School, Cooper University Hospital, Camden, NJ and Dr. Nicola is with the Department of Imaging Sciences, University of Rochester Medical Center, Rochester, NY.